I volunteered myself to write a post about details for this awesome blog. And then I panicked! I got stuck. I wasn't sure how to write it and sound professional and like I know what I'm talking about because it often feels like I don't really. I so often feel intimidated by all of the amazing talent I see and it's scary to put myself out here amongst it. But then I remembered why I wanted to do this - because I love details and using them to tell a story and this year I've really found my voice and what I love to shoot. So basically I'm just going to share some of my favourite detail photos and my thoughts, as rambling as they may be, and hope it inspires at least one of you to look a little differently sometimes and get in closer, capture those magical details and love them as I do! So yeah, I'm Bex Maini and I'm a sucker for details. I love those crops getting right up close, some of my favourite photos are actually of random body parts and I seem to have a fascination with feet! Details are such an important part of storytelling for me. As well as little toes, I love seeing the way children hold onto things, their little fingers gripping tightly like in this example below of my daughter on the beach trying (and failing) to keep up with her melting ice-cream in the mid-day sun! You don't need to see her face to feel the joy in this photo, she's enjoying that ice-cream so much she's unaware of the long trickles flowing over her little fingers and down her arms. Real childhood, messy, fun and not a care in the world. Tales of summer from our garden often include bubbles and the paddling pool, I love this shot of a tiny bubble which landed in my daughter's hair, framed by the sunlight. It's so important for me to record the little details I know I'll want to remember which includes my 3-year-old daughter always having a bum cheek hanging out of her swimming costume or pants! I don't know how she always manages it but it's so cute. The second shot was taken on the day I started toilet training my twins, I got through it by documenting our day at home, their first in pants. As much as I adore colour and often tend towards vibrant shots, I also love rich deep tones. As well as the bright happy summer shots I also love to use shadows to bring the focus to the details like my daughter touching her lip while home poorly one day or my son's shoulder during one of his first "successful" showers when he actually started to enjoy the water falling on him. I always try to include some detail shots in my storytelling sessions, they make a spread in an album so much more interesting and varied. I really do find details are where the magic is and they bring so much to the overall story as in these spreads I'm currently designing (please excuse the poor quality screen grabs). I find so much inspiration through sharing my love of details and recently started a new project with 11 other photographers who love details too, I created the group Details by the Dozen and every month we'll be sharing our favourite detail image to help us inspire each other and keep pushing ourselves to find creative ways to capture details. 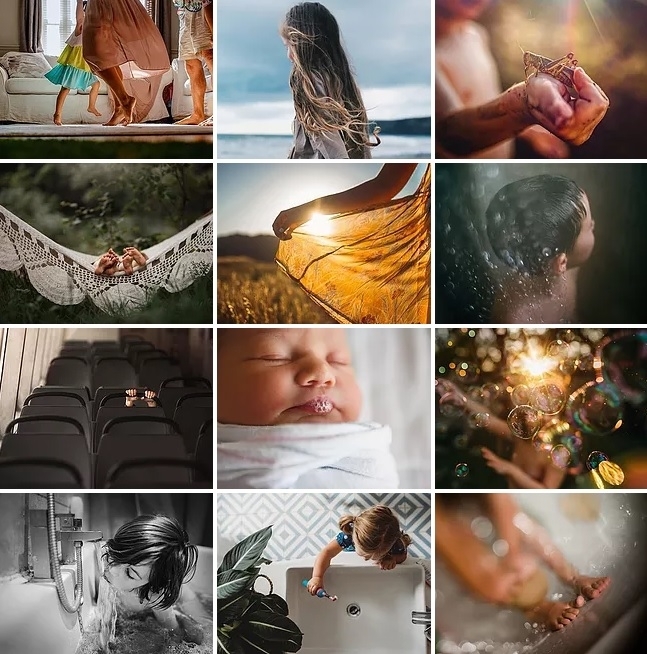 There's some amazing talent in our group, most of whom I found via my @ThisDetailedLife hub where I and a couple of photographer friends feature our favourite detail photos from the hashtag #thisdetailedlife. We'd love it if you joined our community of detail lovers.